This lovely, easily absorbed hand lotion moisturises your hands and leaves them with a delicate fragrance. 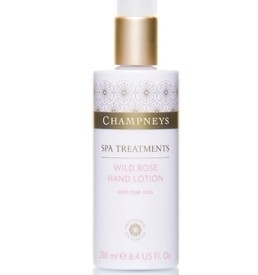 This lovely, easily absorbed hand lotion is inspired by the Champneys Pink Cluster Rose and combines aromatic rose essential oil, moisturising meadowfoam seed oil and protecting Vitamin E to soothe and condition your skin, leaving behind a delicate fragrance. 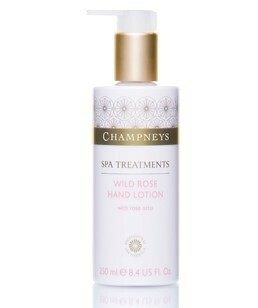 Therapists at Champneys recommend keeping a bottle in the kitchen and bathroom to use after Wild Rose Hand Wash. Massage into your hands, using upward strokes, paying extra attention to your nails and cuticles. Aqua (Water), C12-15 alkyl benzoate, Glycerin, Ethylhexyl palmitate, Glyceryl stearate SE, Cetearyl alcohol, Cetearyl glucoside, Dimethicone, Benzyl alcohol, Glyceryl stearate, Limnanthes alba (meadowfoam) seed oil, PEG-100 stearate, Parfum (Fragrance), Methylparaben, Sodium PCA, Phenoxyethanol, Carbomer, Benzyl salicylate, Propylparaben, Tocopheryl acetate, Xanthan gum, Citronellol, Sodium hydroxide, Dipropylene glycol, Disodium EDTA, Benzotriazolyl dodecyl p-cresol, Linalool, Alpha-isomethyl ionone, Propylene glycol, Alcohol denat., Geraniol, Alcohol, Tris (tetramethylhydroxypiperidinol) citrate, Rosa damascena flower extract, Denatonium benzoate, CI 17200 (Red 33). I love the scent of this hand cream as with all champneys products. The packaging looks great quality and the product feels quality too. 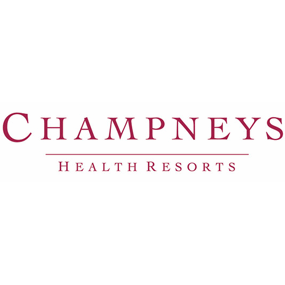 Champneys products are consistently good value and quality and the hand lotions from the range are good quality. I especially like the bottle of the Rose range which has beautiful gold detailing and a sanitary and practical pump dispense which prevents over usage of your product. The lotion is a medium consistency and absorbs easily into the hands without leaving a greasy residue. The vitamin E and essential oils within the lotion leave your hands feeling soft and smooth. The fragrance is pleasant but I do find it slightly synthetic and not a true natural rose. I also find that I need to re-apply this lotion regularly as it is not hydrating enough for my hands; however, it is a fantastic lotion for keeping by the sink for the extra special touch. A really nice hand cream, although the consistency isn't as thick as I usually like, it does absorb really well and leaves hands nice and soft. A lovely rose scent that leaves hands feeling moisturised and relieves that tight feeling after washing. The pump dispenses just enough to cover the hands and is easy to use. "I love the scent of this hand cream as with all champneys products. The packaging looks great quality and the product feels quality too. the..."